After experimenting with iTelescope.net's remote robotic telescopes for astronomy education, imaging galaxies, and galaxy clusters, I figured it was now a good time to target another type of deep-sky object. First thing this morning around 3:00am, MDT, Telescope T-21 (Planewave 17" f/4.5 CDK) was available for imaging at New Mexico Skies. 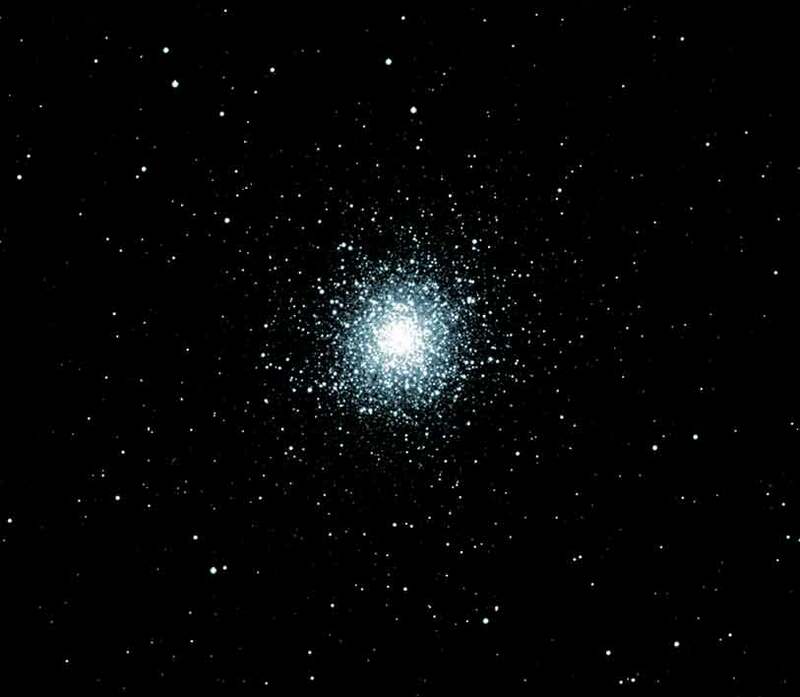 The moon's phase was near full in the western part of the sky and Messier 13 (M13) , the Great Globular Cluster in Hercules was becoming high in the eastern part of the sky. This was my first attempt at imaging a deep-sky object when the moon was so bright using these telescopes. After making a 5-minute exposure with only a luminance filter, the result is what you see to the left. I used the FITS Liberator and Adobe Photoshop CS6 for post-processing. I converted the FITS-processed grayscale image to RGB in Photoshop and added a blueish hue to the image for effect. I find it absolutely amazing that when there is nearly a full moon in the night sky, observers are still able to take images of deep-sky objects with no interference from the moonlight. 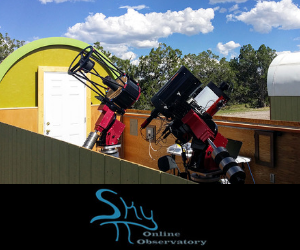 As I referred to the "All-Sky Camera" at New Mexico Skies to check the sky conditions before imaging, I could barely make out only a few of the brightest stars accompanied by an overexposed view of the moon. Also, because of today's technology with advanced CCD Cameras and precision mounts that track the sky so accurately, it only takes about 5 minutes to get an image like the one above. The image to the right is of M13 as well taken back in May 1988. My friend Harry Hammond of Mashpee, MA captured this nice shot of M13 using his Celestron 8" telescope with an Olympus OM-1 camera body attached to the telescope. This method of astrophotography is known as "Prime Focus" astrophotography. 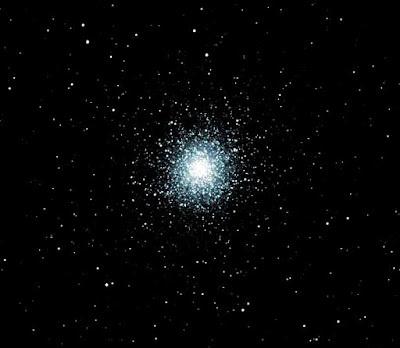 The image of M13 was published in Sky and Telescope magazine later that year. Before CCD technology became readily available to amateur astronomers, this was the contemporary method for photographing deep-sky objects. 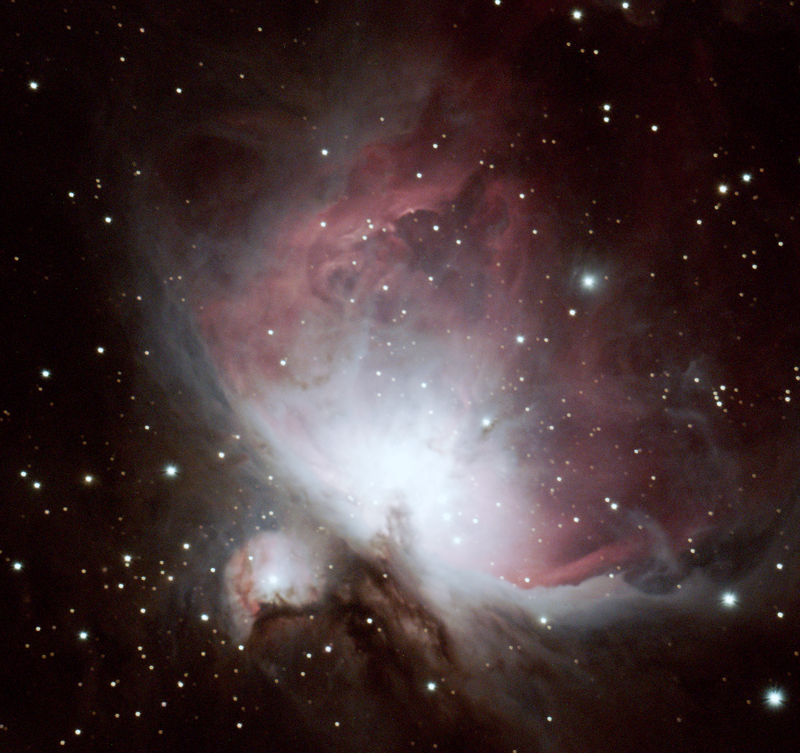 This image took 30 minutes on ISO 1600 print film with manual guiding to make sure the object did not drift due to periodic errors in the telescope's clock drive. Although the image I took this morning was faster to create and has more detail, the equipment and technology is far more expensive and not an as readily available for most amateur astronomers. Messier 13 (M13), also designated NGC 6205 and sometimes called the Great Globular Cluster in Hercules or the Hercules Globular Cluster, is a globular cluster of about 300,000 stars in the constellation of Hercules.M13 is about 145 light-years in diameter, and it is composed of several hundred thousand stars, the brightest of which is the variable star V11 with an apparent magnitude of 11.95. M13 is 25,100 light-years away from Earth. 13 was discovered by Edmond Halley in 1714, and cataloged by Charles Messier on June 1, 1764. The Arecibo message of 1974, containing encoded information about human race, DNA, atomic numbers, Earth position, was beamed there for being picked up by a potential extraterrestrial civilization. It will reach the cluster in 25,000 years.